I am thrilled that Yoav Potash’s debut feature documentary, Crime After Crime, will world premiere at the 2011 Sundance Film Festival as part of the US Cinema Documentary Competition. Like last year’s Family Affair directed by Chico Colvard, which I also saw in early stages, this is a small, very personal piece where the filmmaker was caught up in a story that had to be told. Thinking it would take him about a year to shoot, produce and release the film, six years later, Postash is unleashing a potent piece of testimony that will profoundly change things for the better for many—we hope. I also hope that my sense that Oprah is hovering is accurate (or some equally powerful distributor of documentary film work), and that Crime After Crime gets seen by as many people as possible. It is an important film. Like the subjects in Colvard’s film, namely his three brave sisters who recount decades of violent sexual abuse at the hands of their father for Colvard’s camera, Crime After Crime is about a powerless woman of color who sacrificed her life, and that of her family’s, to something grossly unjust. Like Colvard’s three sisters, Deborah Peagler made some extremely bad choices due to ignorance, naïvete, profound fear, and a dangerous disregard for her own well-being. In 1983 in Los Angeles, Peagler was living as a victim of daily brutal abuse at the hands of her boyfriend (and the father of one of her little girls). Oliver Wilson had also been forcing her into prostitution to support his drug habit. A person who knew both of them offered to help “fix the problem” by threatening and physically attacking Wilson so that he’d leave Deborah alone. After Peagler leads Wilson to a meeting spot where he will meet his attackers, she leaves the scene. Wilson ends up dead and Peagler is sentenced to 25 years-to-life for her connection to his murder. 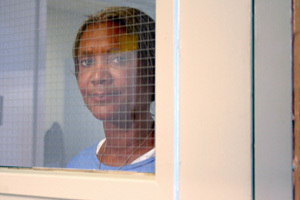 Still serving her sentence 20 years later in central California, a law allowing incarcerated domestic-violence victims to reopen their cases (and there are tens of thousands in prisons all across this country) was passed in the state capitol of Sacramento. The film begins when we meet Joshua Safran, a close friend of Potash’s, and Nadia Costa, two Oakland-based land-use attorneys who decide to take on Peagler’s case pro bono, and try and finally get her released. In the beginning, they are convinced that with all the explicit evidence they have gathered and first-person testimonies of Peagler’s abuse at the hands of Wilson, they would be able to free her very quickly. In the meantime, Peagler had become a model prisoner—finishing her education, leading the prison choir, becoming a responsible manager in a manufacturing facility, and counseling and helping other abused women. A deeply spiritual and positive individual, she goes about inspiring herself and other women like her to heal and move on, even though they are stuck behind prison walls, some for life. Very soon after getting involved in Peagler’s case, the two idealistic and hard-working lawyers—Safran, an observant Orthodox Jew, Costa a long-distance runner, both devoted spouses and parents—realize the depth of rampant political and legal corruption in the state of California. Potash’s unrelenting camera is there to record it all. It takes Safran and Costa five long years to get Peagler released, and the fight becomes a personal crusade to save the life of a woman they have both come to love deeply. Time and time again, they accompany Peagler to her parole hearings. Time and time again, her parole is denied. By the time she is released in 2009, she is dying of cancer. There are many things about this film that are deeply moving and the story is downright apocryphal. There is the dedication of its director and his crew to document every aspect of the story, and there is the transcendent relationship that Peagler, Safran and Costa develop over the course of this David-and-Goliath battle with the state of California’s justice system. There are plenty of built-in dramatic twists and turns to keep a viewer on the edge. There are straight-out heroes. There are dastardly villains. Thankfully, by not getting fancy about any of it, Potash creates a riveting, expertly edited piece that clips along to its triumphant (and devastating) conclusion, illustrating an individual life sacrificed for the benefit of thousands of others with the same story. The true triumph is in the undying dedication Safran and Costa, both in their early 30s, display on a daily basis for years on end with no remuneration, precious time spent away from their families, late nights and early mornings of exhaustive research, filing, investigating, gathering evidence, fighting the good fight no matter how long it takes. By connecting so deeply and intimately with his three main subjects, Potash tells an incredibly beautiful story, powerful and true. Oprah did, indeed, hover. Her network bought this film today.